The original organ at St James Clerkenwell was built by George Pike England, an ancestor of the Mander family, in 1792. It was enlarged by Gray and Davison in 1877. In 1929, the instrument was extensively altered by Noteman, who moved the case some five feet forward and built what was effectively a new organ inside it. The soundboards were turned through 90 degrees, and a new pneumatic action console was detached at the side of the gallery. The largest case pipes were replaced in zinc, and the smaller flats disconnected and left mute. The Choir Organ was outside the case on the South side, under the Children's Gallery. 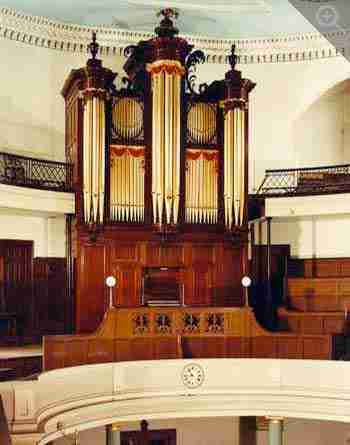 When major attention became necessary, it was decided to build a new organ incorporating the original casework and surviving England pipework. In addition, two Gray and Davison stops were retained on the pedal. The stop list, style and appearance of the organ were all made to be in keeping with English 18th century practice but the instrument was not conceived as a true restoration, as this would have been too limiting, and there was too little original material surviving to make this worthwhile. The magnificently-built mahogany case was restored to its original position and proportions and was stripped and re-polished, the painted and gilded decoration being restored. New plain metal pipes were made to replace those of zinc, and the England flats were brought back into use, all being gilded. The soundboard, framework, action and winding are all new, as are 8 of the 22 stops. The Swell Organ is mounted above the Great, with the pedal divided on either side in traditional fashion. The trackers and levers are of cedar and the rollerboards are metal. The winding incorporates two wedge reservoirs. The new console was designed to reflect the period casework.